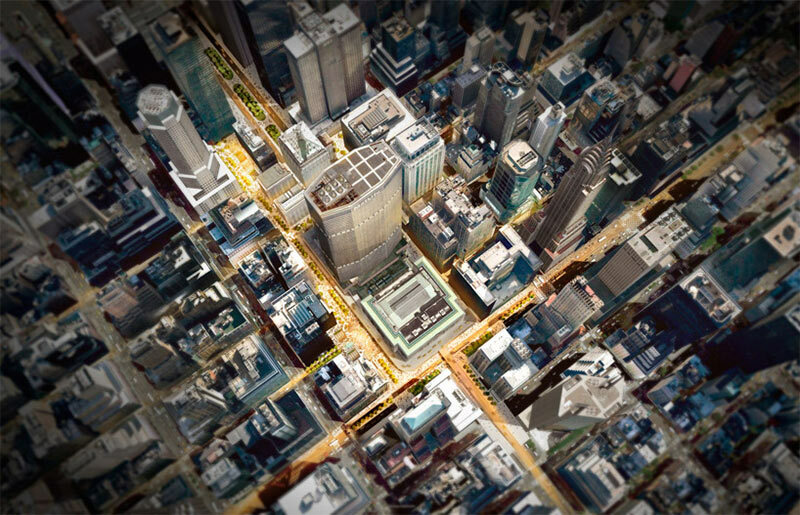 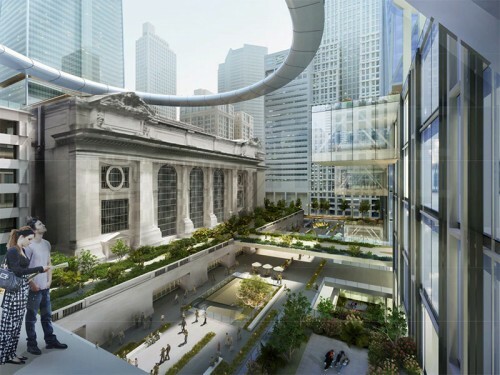 The neighborhood around Manhattan’s Grand Central Terminal is about to undergo monumental change as the Bloomberg administration pushes to upzone areas around Park and Madison avenues. 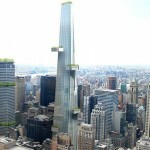 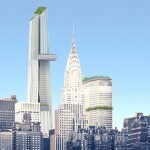 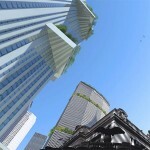 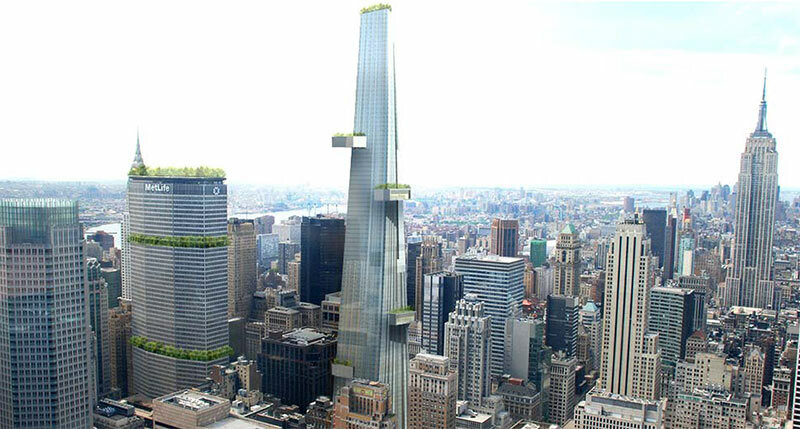 Already, Norman Foster recently unveiled his plans for a new 425 Park tower, viewed as a precursor to what’s bound to be a taller neighborhood and the NYC Department of Transportation announced intentions to close Vanderbilt Avenue to automobile traffic to help with already-overflowing sidewalks. 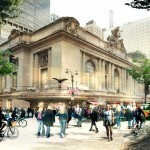 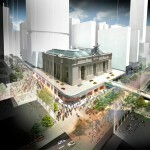 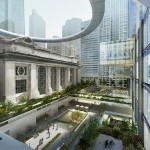 But in anticipation of Warren and Wetmore‘s Grand Central celebrating its centennial next year, the Municipal Art Society (MAS) asked three firms—SOM, WXY, and Foster+Partners—to re-envision the Beaux-Arts masterpiece and its surrounding midtown neighborhood with an eye toward the train station’s next 100 years. 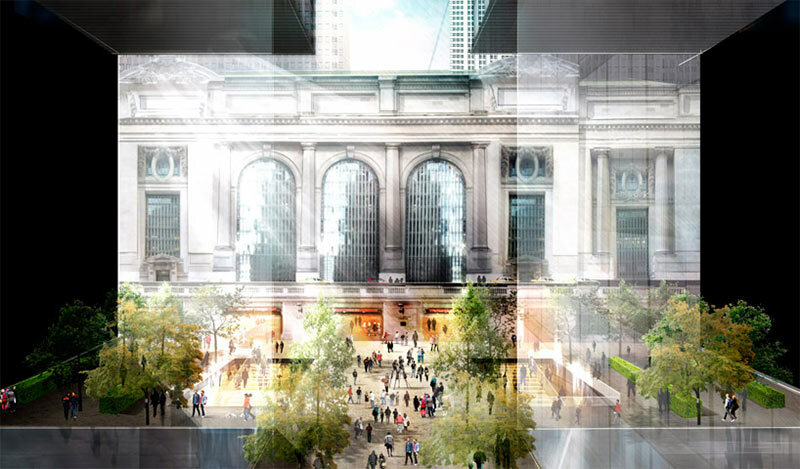 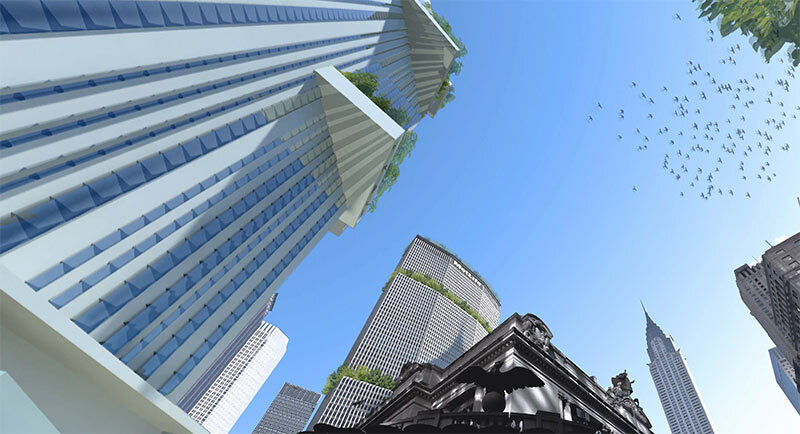 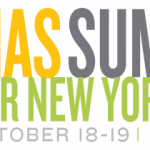 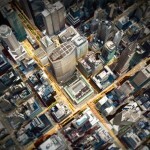 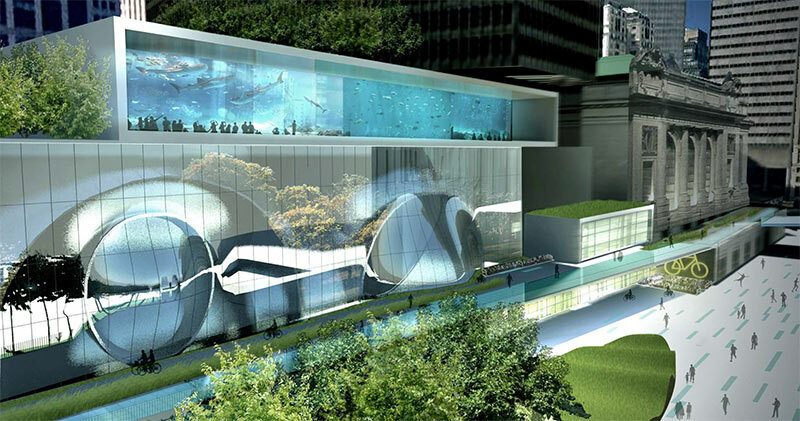 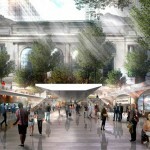 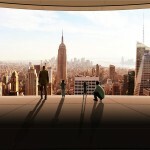 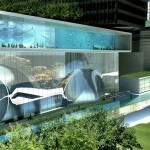 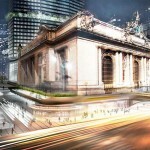 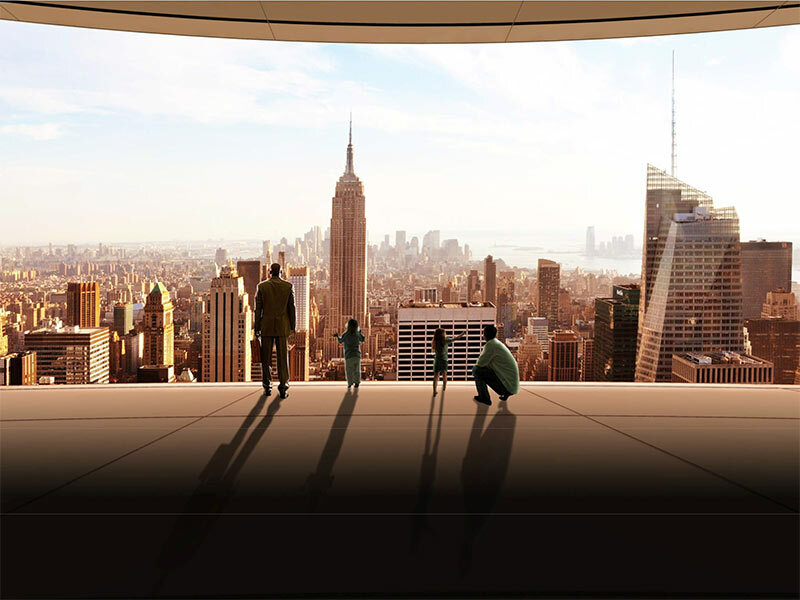 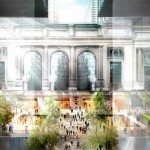 The results of the Grand Central…The Next 100 project were unveiled at this year’s MAS Summit for New York City, which wrapped up on Friday and included both down-to-earth and fanciful visions for the future of Manhattan. 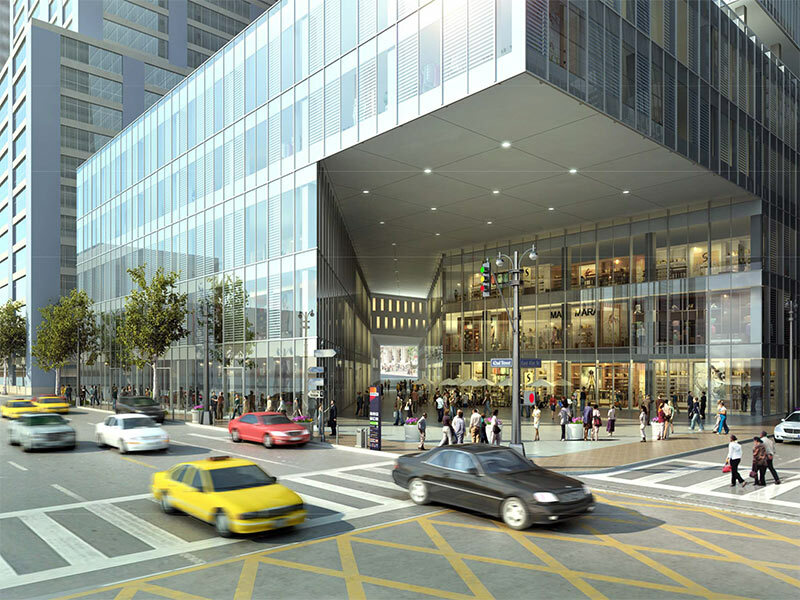 The result is acute overcrowding; connections to the rail and subway lines beneath the concourse are inadequate; and the arrival and departure experience is poor. 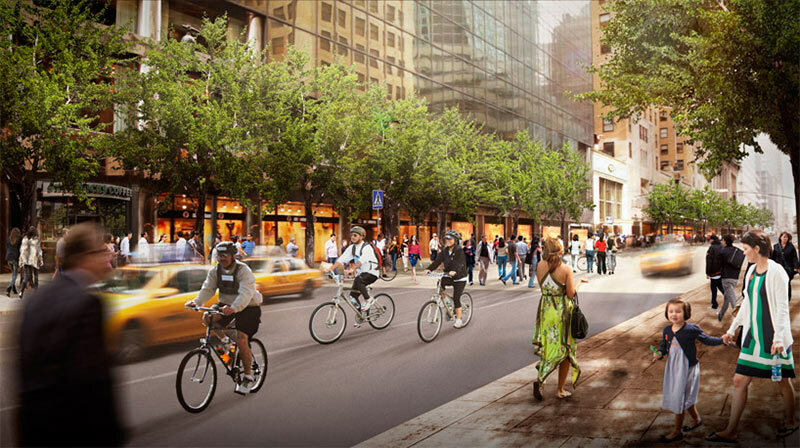 Added to that, the surrounding streets are choked with traffic and pedestrians are marginalised. 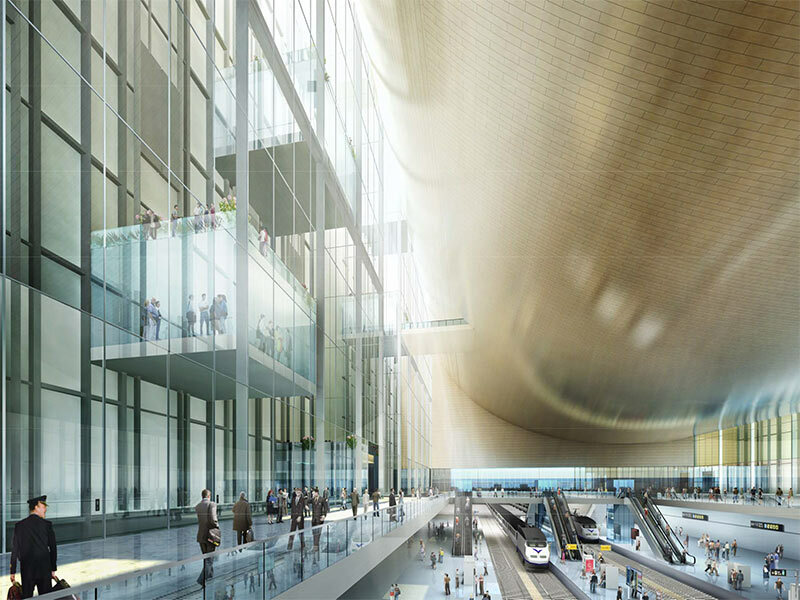 The rapid growth of tall buildings in the vicinity has all but consumed the Terminal. 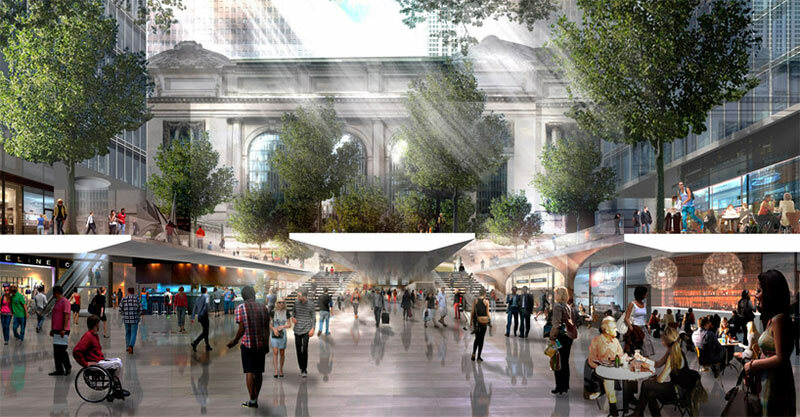 All three proposals recognize the importance of the pedestrian realm and push for expanded public space, not only along Vanderbilt Avenue, but also along the terraced Park Avenue weaving around the terminal and along diagonal corridors carved through surrounding buildings. 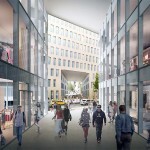 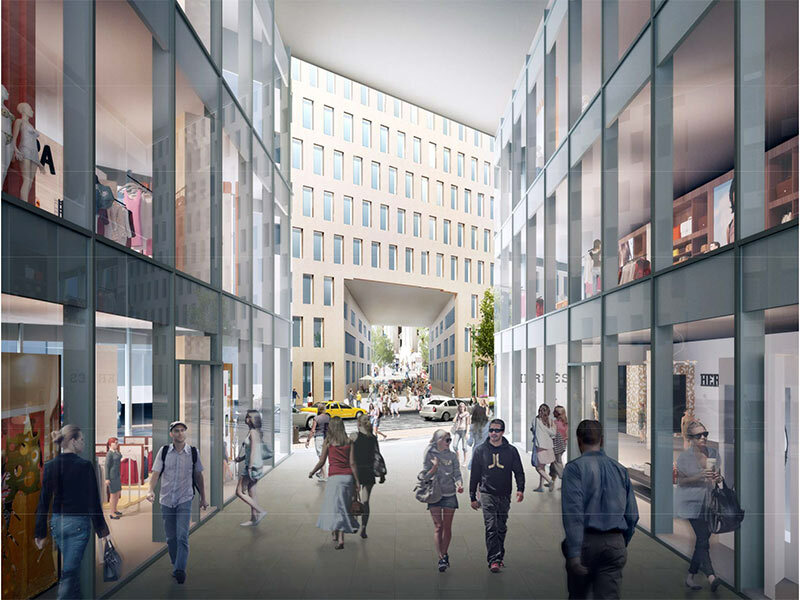 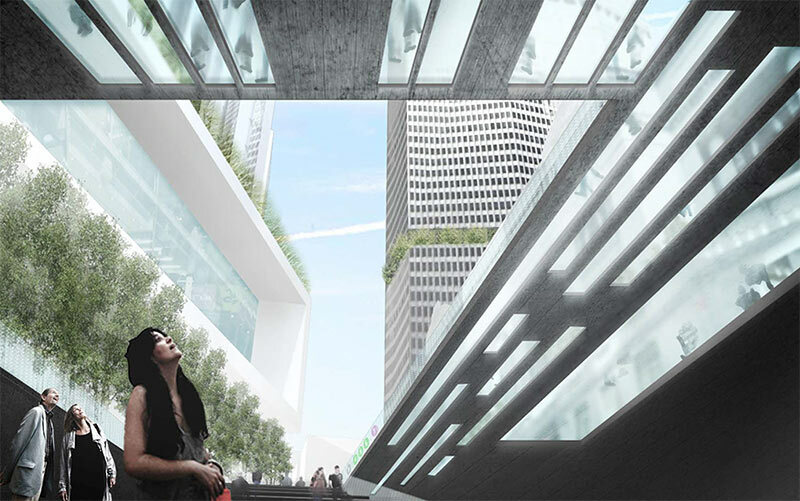 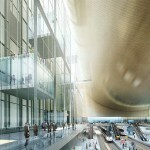 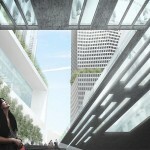 The three teams also proposed different ideas of layering spaces, connecting the street level with a terraced viaduct surrounding the terminal and connections to the activity happening underground. 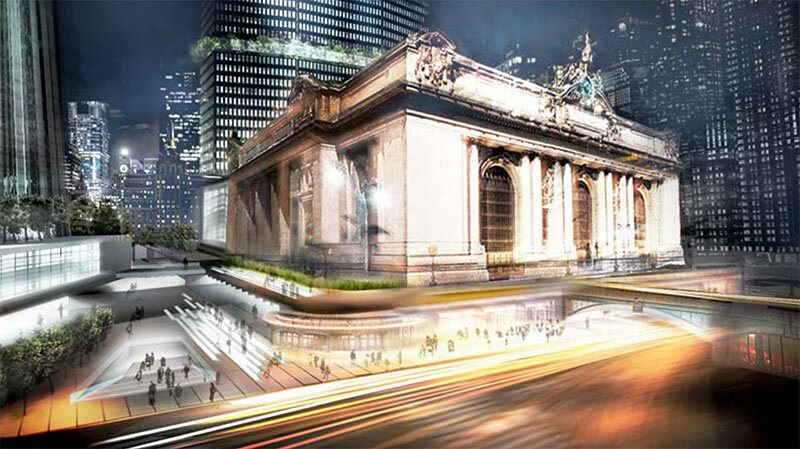 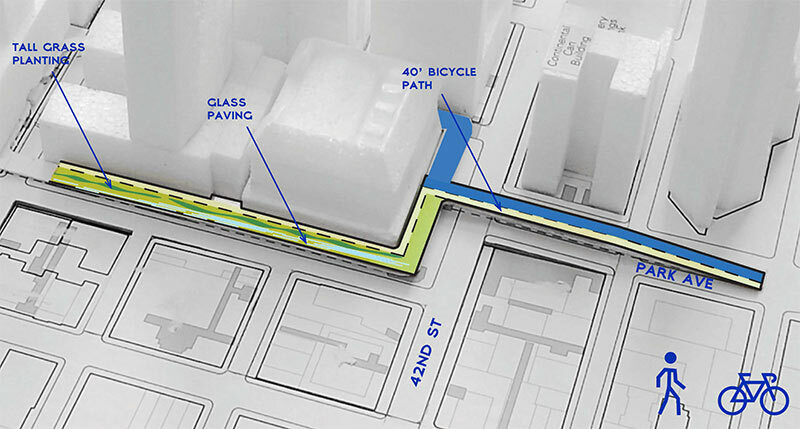 WXY peeled away portions of Vanderbilt Avenue to reveal the subterranean infrastructure that makes Grand Central tick, providing both interesting view corridors and easier access to the train station. 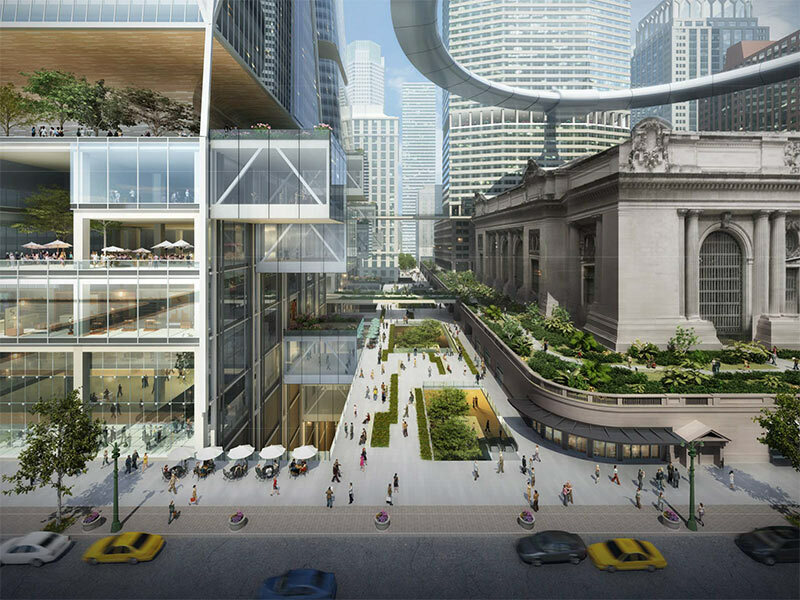 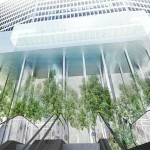 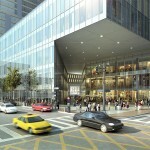 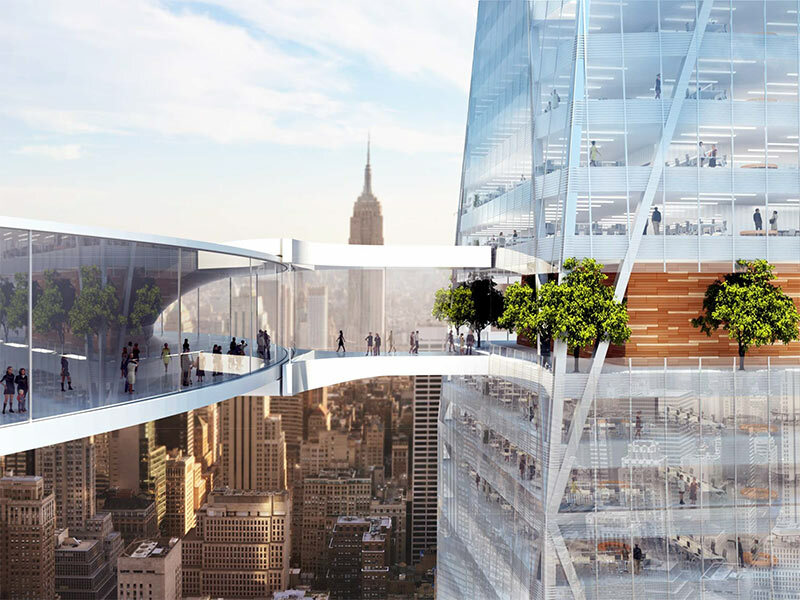 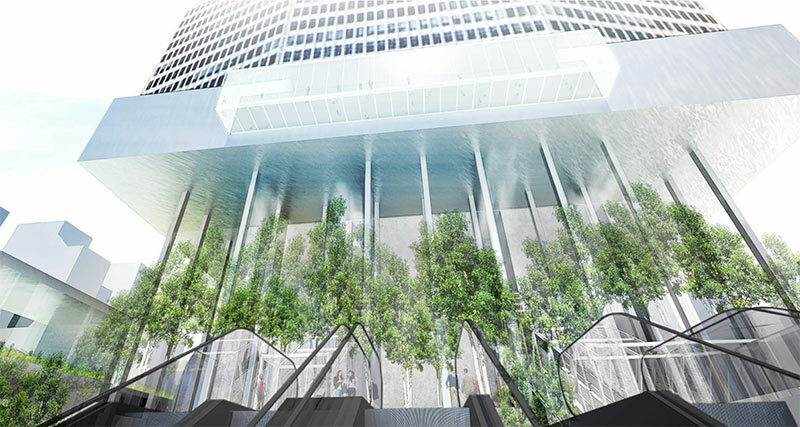 The new pedestrian plaza is bookended by an proposed new super-tall tower at its southern terminus and a reimagined MetLife building planted with trees and repurposed as residential, office, and hotel uses with an ambitious cultural anchor at its base. 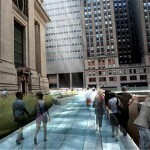 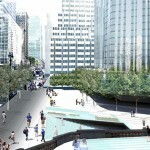 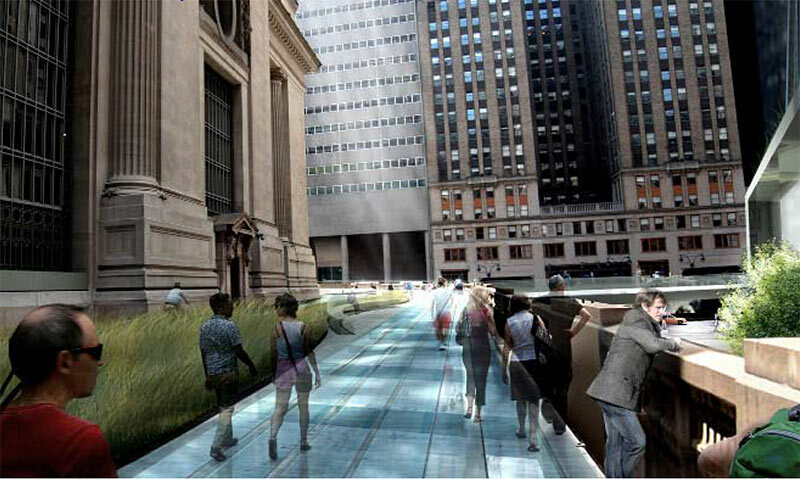 The Park Avenue viaduct has been divided to provide separate automobile and pedestrian / bike access. 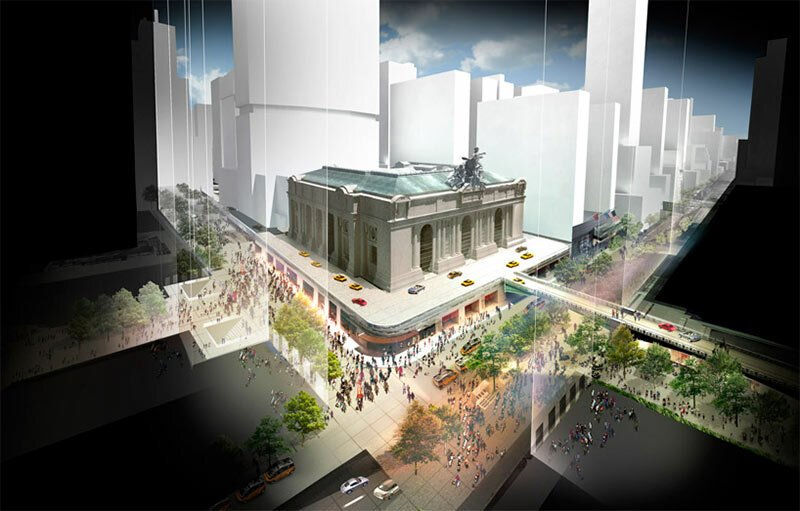 In addition to turning Vanderbilt Avenue over to pedestrians, Foster reimagined the streets surrounding Grand Central as shared spaces where pedestrians, cyclists, and automobiles share space in a slow-moving environment with faster traffic bypassing the area through an underpass. 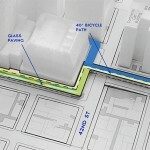 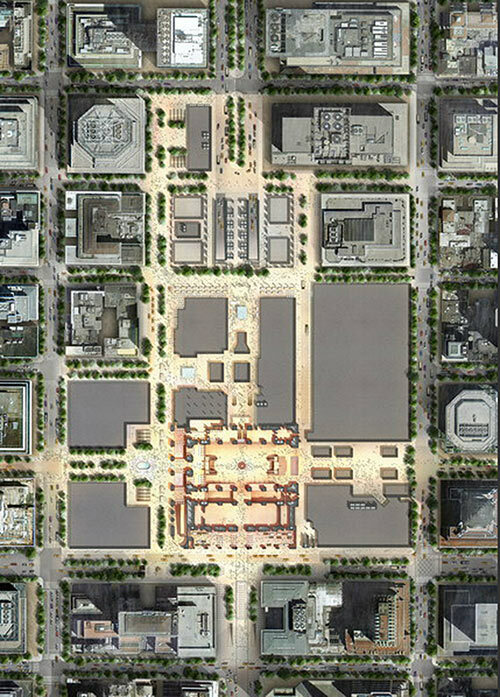 Through a series of small-scale interventions, Foster sought to provide “breathing room” around the terminal that allows visitors to linger and experience that place rather than simply rush through, accomplished in part through a series of cuts in the pedestrian plaza leading to retail zones. 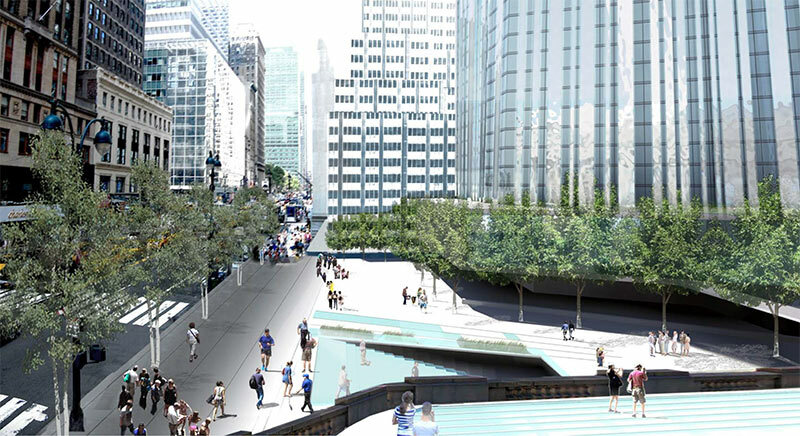 SOM similarly addresses the ground plane with more nuanced pedestrian space, also turning over the entire Park Avenue viaduct to pedestrian use. 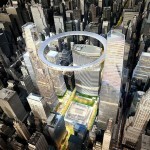 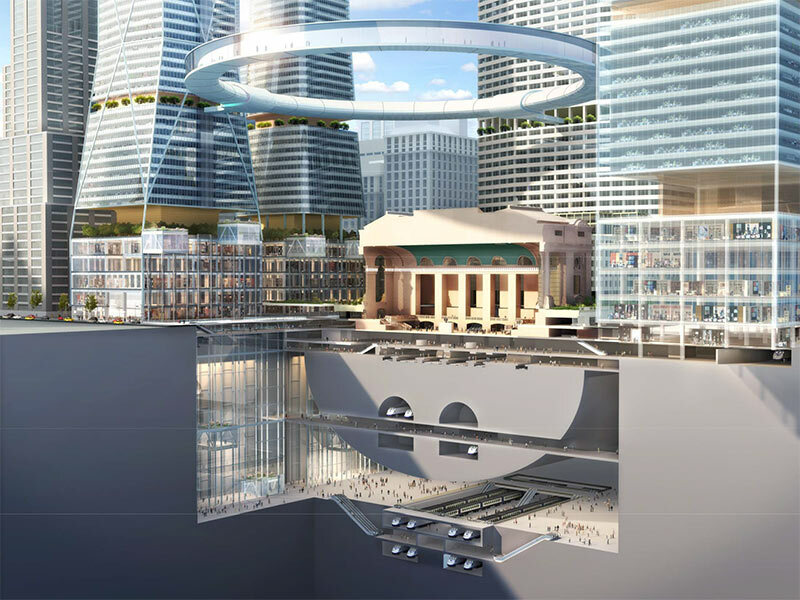 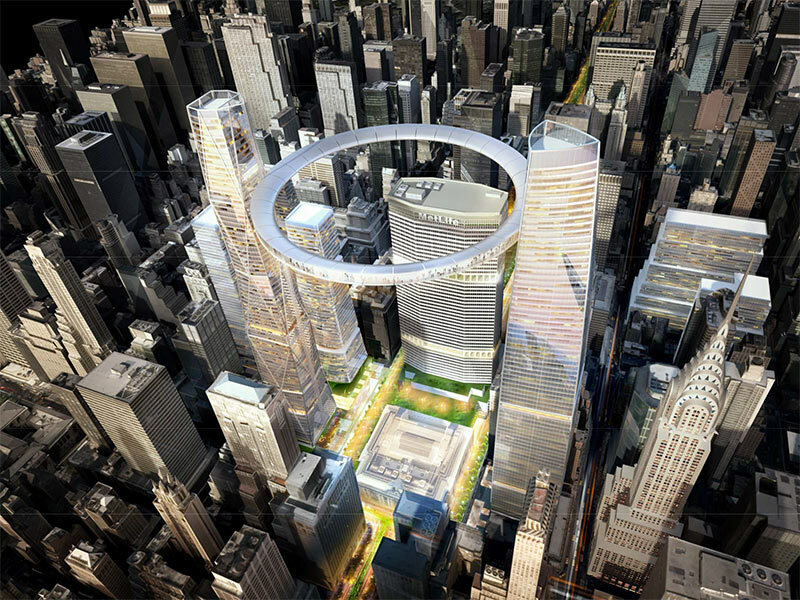 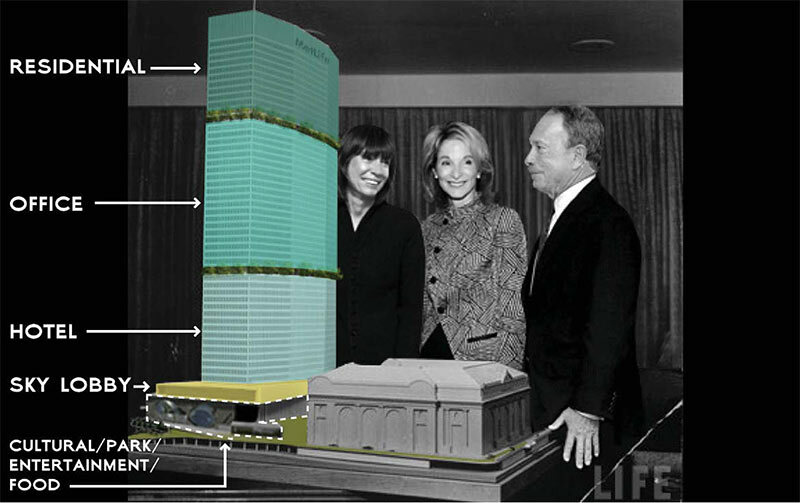 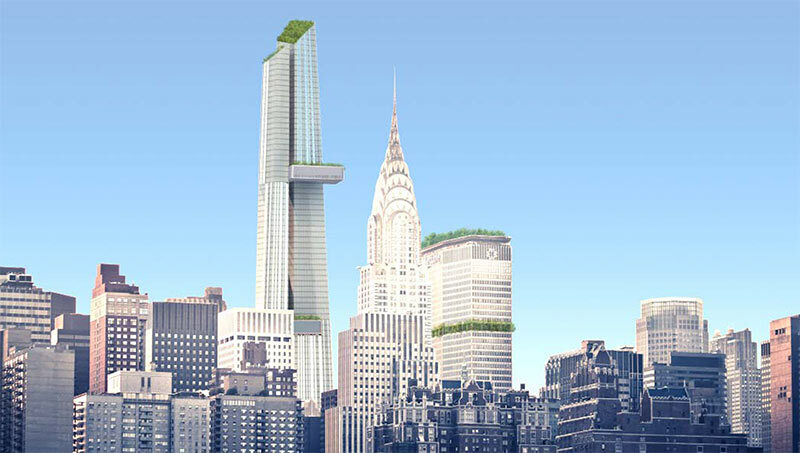 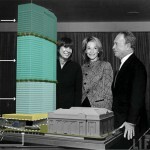 Their plans turned monumental with several large towers proposed flanking Grand Central with a moveable ring connecting the two floating over the station. 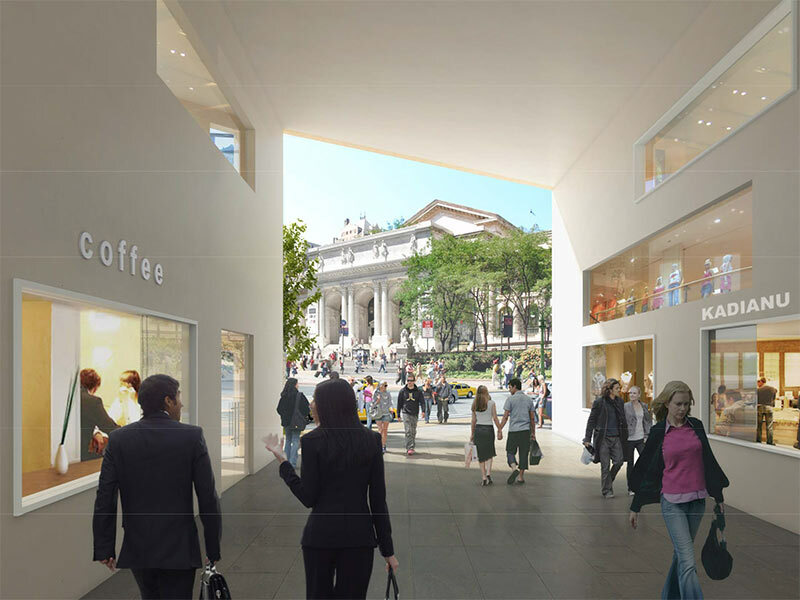 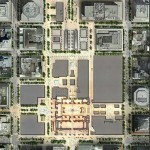 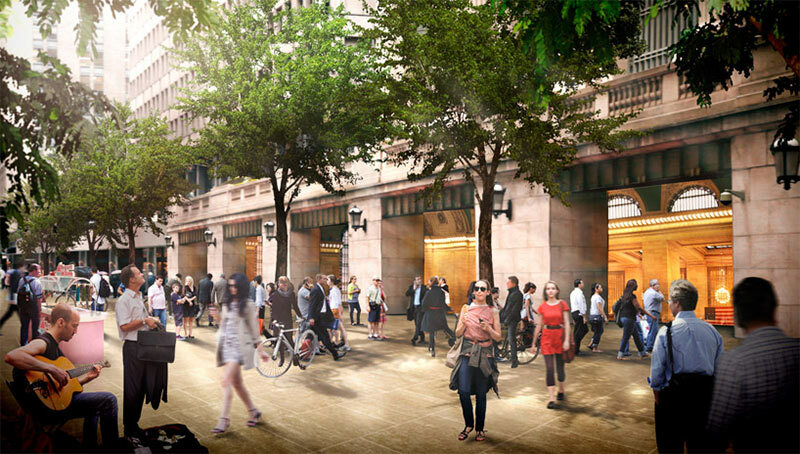 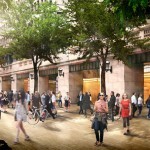 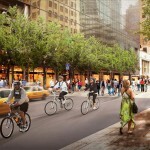 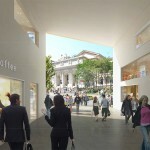 SOM also reached out into midtown with a series of POPS, privately owned public spaces, forming diagonal pedestrian streets modeled after the recently opened Holly Whyte Way that connect to surrounding landmarks like the New York Public Library. 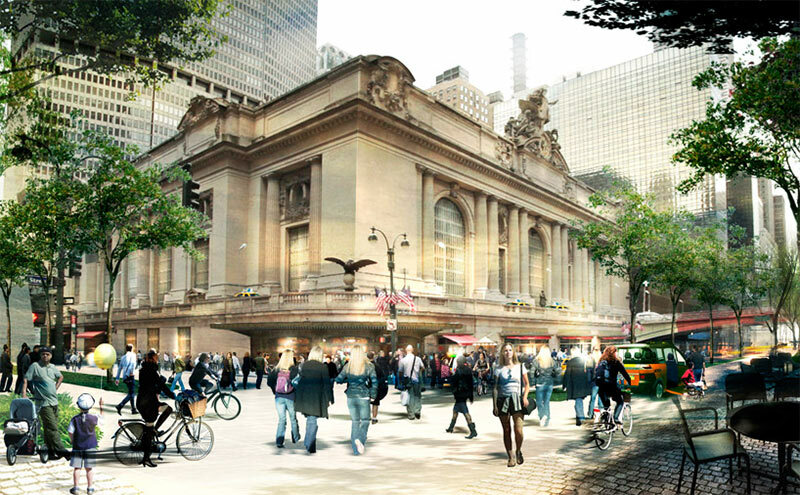 As a major transportation hub, a historic building, and a commercial space, Grand Central is among the most important anchors in all of Manhattan, and MAS President Vin Cipolla emphasized the need to acknowledge the public experience in the midst of the ongoing rezoning initiatives. 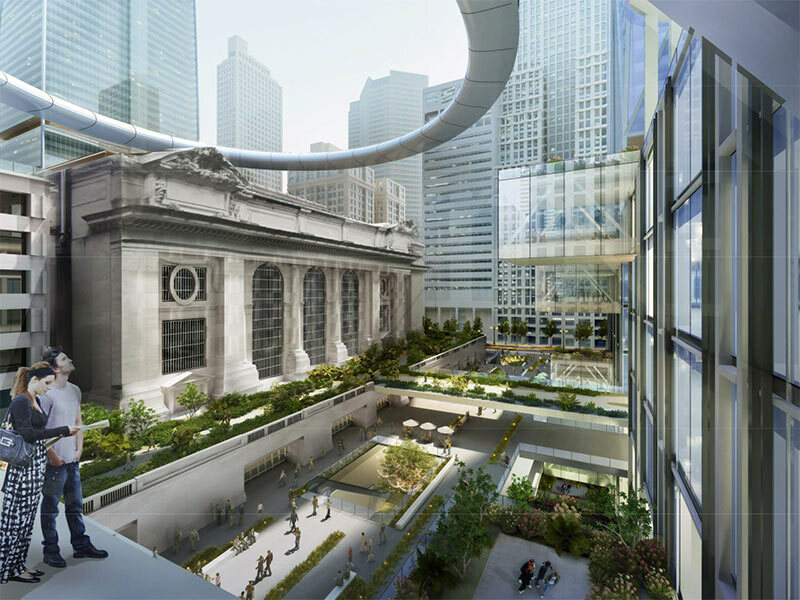 Foster added that MAS’s focus on the next century of Grand Central “represents an important and welcome debate that will help shape the future form of the city. 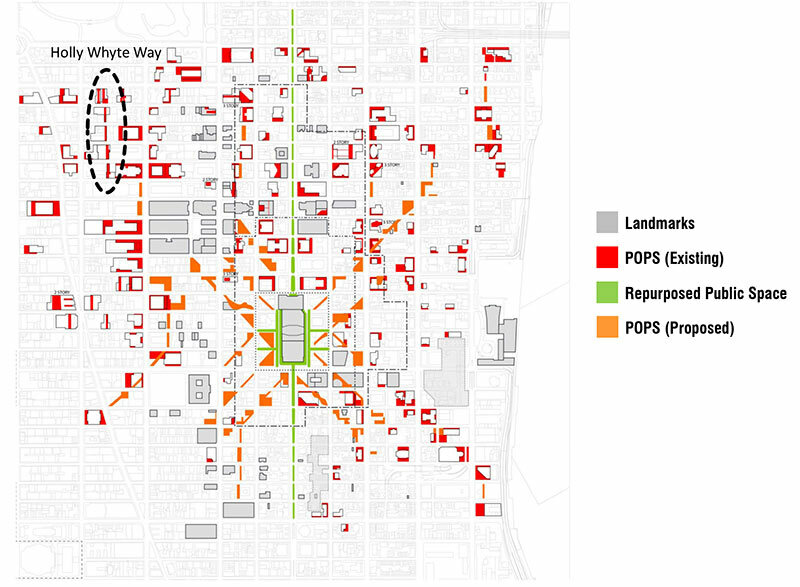 The quality of a city’s public realm reflects the level of civic pride and has a direct impact on the quality of everyday life.” The results of The Next 100 will help the MAS is compiling its forthcoming report,The Future of Midtown.